"MaxiAids Exclusive Money-Saving Low Vision Bundle"
- Measures 11 in. x 17 in. ; opens to 22 in. x 17 in. The Giant Appointment Calendar is ideal for those with low vision. Our largest size calendar, this is a great aid for those with vision impairment. View a month at a time when the calendar is opened. Includes plenty of room for notes on each day with printed lines that make it easy to write in and track your daily meetings and appointments. Shows U.S. holidays. This spiral bound giant print calendar opens to show the whole month of days and dates. 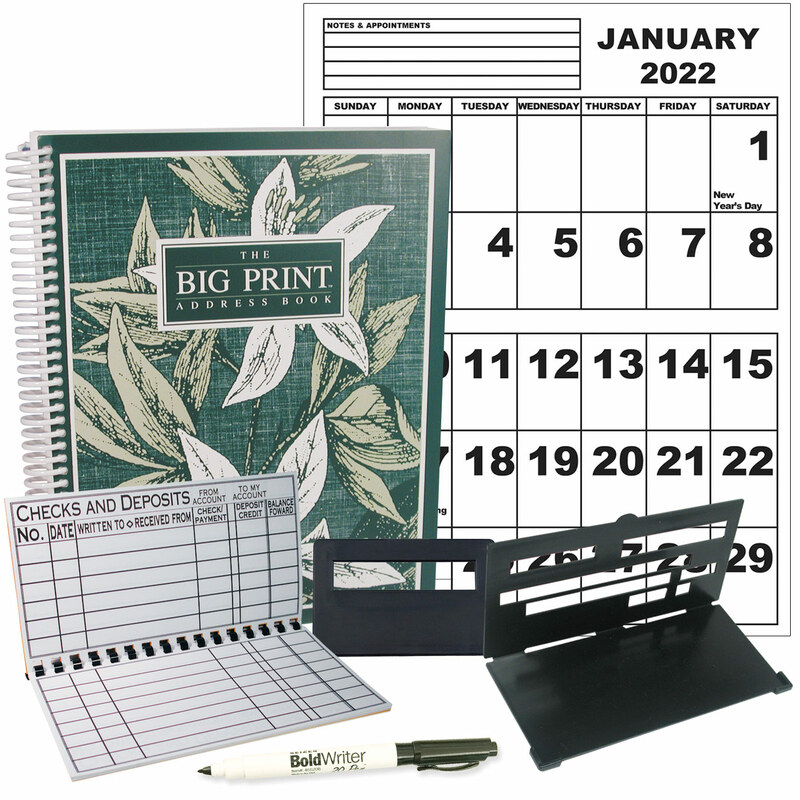 Featuring a large-print, 72 point (1-inch) numbers with room to make notes in each box, this low-vision calendar also includes pages for users to write notes and track appointments. The Big Print Address Book features oversized writing spaces, with three listings per page. The book lays flat for easy writing. This Big Print Address Book offers a generous 500 address listing spaces. - Each page has space for 14 entries. The Giant Print Check Register when closed measures 4.875 in. x 9 in. to fit in your pocket or purse, and opens to a large 8.75 in. x 9 in. for easy entries. - Frame holds standard check size 2.75 in. x 6 in. This pocket check writer makes check writing a breeze for those with low vision. Convenient plastic signature guide will always be on-hand when you need it. - The superior pen for those without 20-20 vision. - The BoldWriter 20 Pen produces easy-to-see and read, bold, black lines -- ideal for both the visually impaired and those with low vision. This low-vision pen won't smudge or bleed through most paper -- it's just what you need for large-print calendar appointment entries, making labels, writing notes, shopping lists, etc. The BoldWriter 20 is the high-visibility pen for those with low vision.